The news broke a few hours ago: President and Michelle Obama are sending a holiday card -- ecumenical, of course -- made by American Greetings and featuring a "foil-embossed presidential seal surrounded by a wreath, and a thin burgundy border around the edges. It contains the message: 'May your family have a joyous holiday season and a new year blessed with hope and happiness.' "
Vice-president Joe Biden, meanwhile, went a different route. His card, also manufactured by American Greetings, carries a photo of his family on the front and puts the vice presidential seal inside. It's inscribed "Wishing you and your family joy and peace this holiday season." Artists and poets are more original, as two current exhibitions demonstrate, and as I recently mentioned on my ArtsJournal blog in two posts. The first is about a show organized by the Archives of American Art that's on view at its gallery in the Donald W. Reynolds Center for American Art and Portraiture in Washington. It includes holiday cards designed and sent by the likes of Philip Guston, Alexander Calder, Dan Flavin, Kay Sage, Ernest Blumenschein and Arnold Newman. You can read the whole post here. 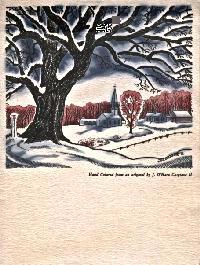 In New York, meanwhile, Poets House has mounted a special exhibition of the beautiful illustrated chapbooks that Robert Frost sent to his friends between 1934 and 1962. I tell the story here. That's where I also link to a few other blogs or institutions that have, over the years, written about Frost's Christmas missives.